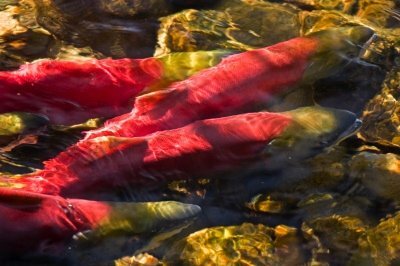 Reuters reports that millions of sockeye salmon have disappeared mysteriously from Fraser River on Canada’s Pacific Coast where was once known as the world’s most fertile spawning ground for this kind of salmon. 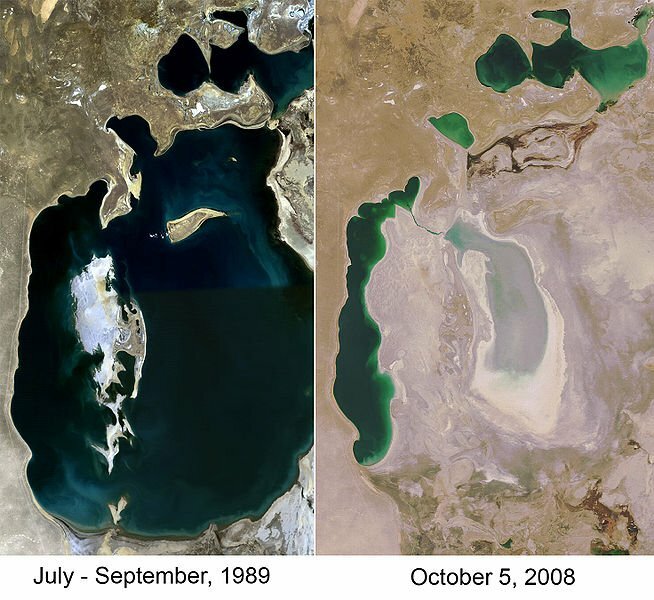 Located between Uzbekistan and Kazakhstan, Aral Sea which was once the world’s fourth largest freshwater lake with an area of 68,000 km2 has been steadily shrinking since the 1960s. Burning of fossil fuels raises chemicals into the air that react on earth’s surfaces. Under the circumstances, this previously unknown chemistry could account for up to 40 parts per billion of ozone – nearly half of California’s legal limit on outdoor air pollution. Ozone can cause coughing, throat irritation, chest pain and shortness of breath. Exposure to it has been linked to asthma, bronchitis, cardiopulmonary problems and premature death. UCI scientists explained; when nitrogen oxides combine with hydrochloric acid from airborne sea salt on buildings, roads and other particles in the air, highly reactive chlorine atoms are created that speed up smog formation. The study was undertaken by scientists involved with AirUCI, an Environmental Molecular Sciences Institute funded by the National Science Foundation. UCI’s Jonathan Raff conducted experiments; Bosiljka Njegic and Benny Gerber made theoretical predictions; and Wayne Chang and Donald Dabdub did the modeling. Mark Gordon of Iowa State University also helped with theory. Nowadays, forests around the world are being destroyed to make tissue products, however you can help stop this terrible action by pressing producers to use recycled content and clean manufacturing processes. 1. Buy paper products with recycled content – especially post-consumer fibers. Look for high recycled content products, post-consumer fibers are recovered from paper that was previously used by consumers. 2. Buy paper products made with clean, safe process. Tissue products are bleached to make them whiter and brighter(they put more chlorine in bleached processes). Look for products labeled otally chlorine-free (TCF) or processed chlorine-free (PCF). In some cases, elemental chlorine-free (ECF) may be acceptable. Tell the brand company to use more recycle fibers, if that brand doesn’t have any recycled content. Saving forests also helps reduce global warming pollution. 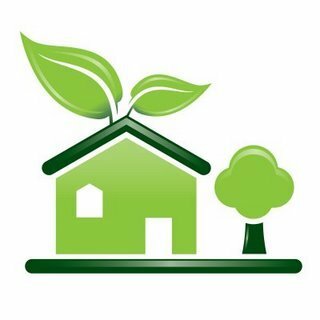 Make your office more environmentally friendly. Try these tips. Consider for compressed work weeks and/or use less telecommuting to reduces commuting and traffic, leading to fewer automobile emissions. If can, be better use laptop as it consumes less energy than a typical desktop PC. Think before you print. Make sure you print only what is necessary. Use both sides of a piece of paper. Try to reuse envelopes as many times as possible. Instead of disposable cups, use glasses, mug or water bottle. Be Consider refillable pens and mechanical pencils rather than disposable ones. Use paperclips rather than adhesive tape. Use crayons or colored pencils instead of solvent-based markers. Make sure you select a sleep or stand-by mode for your copy machine, printer and fax when unused. Turn off your computer and the power strip when you leave. Set a sleep mode for your computer while you are away for short time. Switch out your old standard light bulbs with energy saving bulbs. Turn off the lights when you’re leaving the room for 15 minutes or more. Use natural light if possible. Put it into action and share these with your colleagues. The food choices that we make every day have a deeply effect on our surounding . From farm to fork, growing our food, processing it and transporting it all use colossal amounts of energy, water and chemicals. If you can’t keep your kids away from computer game or can’t tell them not to spend much time on internet. Why don’t you just guide them to where you know it’s fun and safe for children. 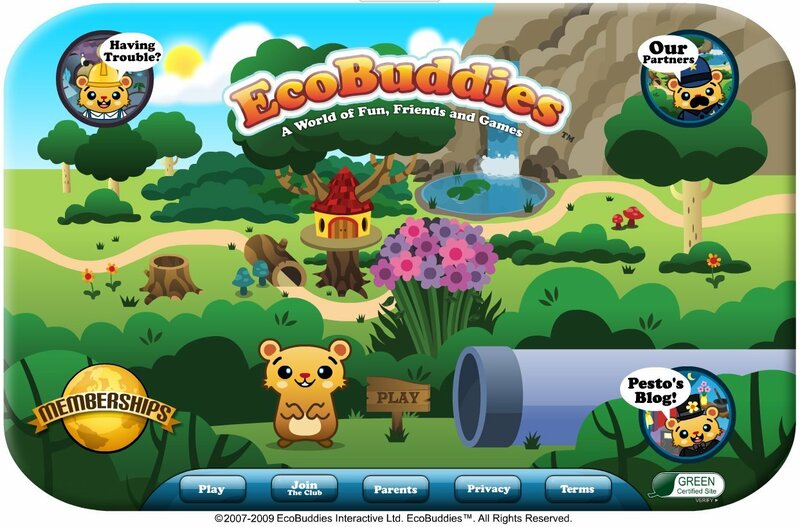 Recently launched eco-oriented online edutainment for kids ‘Ecobuddies.com’ is a safe online virtual world where your children can socialize, play games, create avatars, enjoy purchase and customize things. It was designed for kids aged between 5 – 12. Log on for them and start instilling green values in your kids at www.ecobuddies.com. The finalists includes Amezon Rainforest, Dead Sea, Galapagos, Great Barrier Reef, Halong Bay and Black Forest just to name a few (of course you can see the full list of the finalists in www.new7wonders.com). You can also vote by internet (simply log in to the website) or phone before the winners will be announced in 2011. All I hope now is the wonders still be wonders after all these has passed. Tourism will not harm the nature, will it?